Image courtesy of Robert Vignone (www.robertvignone.com). We're working hard, over here. Shipping printers is our top priority, but we're also working at improving and tweaking our software. Four weeks after our last software update, we're pleased to announce our next software release, PreForm 0.8.2, now available for download. We've been listening to your feedback in our forums and tracking your bug reports. PreForm 0.8.2 provides a number of significant improvements and features over 0.8.1. Most excitingly, for those of you working with large, complex models, like that of @polysculpture's above, you should see significantly-improved framerates and graphics handling. 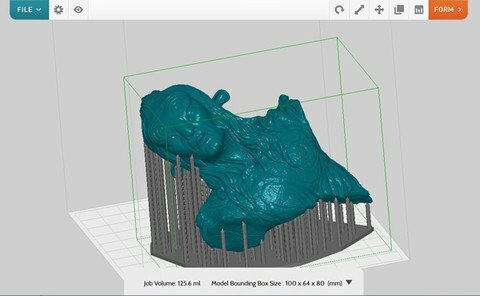 To download the latest version of our software, head to formlabs.com/software. If you've already downloaded PreForm, simply open it again, and you'll be guided through the upgrade process automatically. We have many more exciting updates planned! Apple users, stay tuned. We continue to make progress on a Macintosh-compatible version of PreForm and we'll get it out to you as soon as its ready.